Key words : Material Sciences and Nanomaterials, Nanotheranostics, Laser ablation process. The elaboration of nanosystems as mediated-photothermal ablation of tumors with nearinfrared (NIR) in a deep tissue is very promising way to develop advanced theranostic modalities. 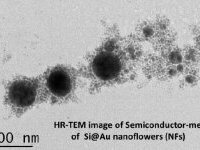 Among conventional nanoparticles (NPs) including carbon nanotubes, graphen, semiconductor-metal NPs based-on SiO2@Au NPs are actively investigated in photothermal therapy. However such NPs are made from conventional chemical methods which can potentially induced toxicity, sequestration by the reticuloendothelial system (RES) and other biocompatibility issues. In addition the chemical protocols employed do not fit with future commercialization products. Driven by its easy handling, rapidity and costeffectiveness, pulsed laser ablation in liquid (PLAL) appeared recently as “green nanosynthesis” method of ultrapure colloid NPs. In our group, we have recently demonstrated the possibility to elaborate very stable semiconductor-metal nanostructures based-on Si@Au. Less than 50 nm in diameter with monitored resonant position toward the biological transparency window, these flower-like (NFs) nanoparticles are very promising photonic based-technology to treat in depth tumors. As a next step of this work, this internship will deal with the (i) optimization of the experimental protocol on the fabrication of Si@Au NFs by laser process and the (ii) functionalization of these NFs by specific interest molecules for active targeting. Besides structural and physicochemical characterizations (UV-Vis, TEM, FTIR, XRD, etc. ), photothermal measurements and in vitro tests will be also performed in collaboration with LMA “Laboratoire de Mécanique et d’Acoustique” of Marseille and the “INP Institut de NeuroPhysiopathologie” of Marseille.